The choice is among more than 700 games, out of which most are slot machines, but there are also all other cohorts and live dealer gaming. The main supplier is Microgaming, and other releases are from the leaders of the industry – Net Entertainment, Evolution Gaming, Next Generation Gaming and more than five other studios. Due to the mobile adaptation, everyone can wager and win at any moment of the day from anywhere. No download is required and everyone can place stakes in the browser, which makes the process so much easier. In addition to the major currency options, the cashier also accepts Bitcoins. Reputable portals provided this place to bet and win with their highest statuses and ranking. Owned by Netincom N.V., Loki was launched in 2016 and joined the company’s network alongside Gunsbet. The licensing authority that issued its permit is the jurisdiction of Curacao, which means that players from most countries around the world can register. Statistically, most frequently the casino is visited by gamers from Russia, Latvia, Ukraine, Turkey and Philippines. Everyone can select among several languages when enjoying this site. Thus, content and support are available in English, Finnish, German, Norwegian, Russian, Spanish and Swedish. As to the gaming modes, the operator is instant all the way – for desktops and mobile devices. Registration can begin by clicking the big green button in this review. All members can select among generous promotions and play plenty of games. The choice of both currencies and deposit methods can satisfy different requests. Thus, payments and withdrawals can be done in Euros, U.S., Canadian and Australian dollars, Bitcoins, Russian rubles, Norwegian and Swedish krones. Players from the Netherlands can use iDeal to add money to their accounts. Scandinavian visitors can select Trustly and Zimpler for the same purposes. Sofort is the option for Germany. As to other methods, there are e-wallets, cards, and the prepaid voucher Paysafecard. Limits for cash-out are not high. Only 4.000 USD are allowed per a single withdrawal, and no more than 15.000 USD can be claimed per month. All payouts start from a minimum of 20 USD, and it can take up to three business days to receive the wins, although the platform promises to pay within one work day. This is a safe and highly rated gambling destination with no major complaints from players. AskGamblers rates it nine out of ten and grants it the status “Certified”. LCB’s verdict if four out of five. Registered members enjoy the big collection of games, but complain that the support group could’ve reacted to the requests faster. The help desk can be reached by phone, email and live chat. Bonus Offers: Welcome deals, high-roller benefits, birthday and reload bonuses, as well as free spins and loyalty points are provided for all clients. Bonus Codes: Each offer requires a promo code, and we list all of them in this review. Game Contribution: Slot machines count up to 100% towards the rollover requirements, whereas table games and video poker contribute only 5%. Cashable: Both bonuses and money won from wagering the bonus can be converted into cash. All newbies can claim an impressive package on several initial payments, and the first deposit receives a 100% match. The wagering requirements are rather complex – 50xB, and the best way to complete them is on slot machines. 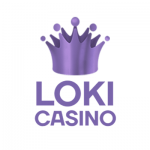 Alongside cash, Loki rewards users of this promotion with up to 100 free spins. Slot machine tournaments are held on regular basis, and high rollers receive additional value. Reload and birthday bonuses are among other offers, and everyone can also take advantage of the loyalty program. Each bet adds to the amount of points, and they can later be exchanged for cash. There are six statuses, which are Beginner, Bronze, Silver, Golden, Platinum and Diamond. The library is impressively big, and offers more than 700 releases from over ten manufacturers. The majority of content is provided by Net Entertainment and Microgaming, and there is also a decent amount of games from Amatic, BetSoft, iSoftBet, Endorphine, Next Generation Gaming and SoftSwiss. Such studios as Thunderkick, Belatra, Amaya and ELK are also hosted, although represented less vividly. Live dealer is brought to the table by Evolution Gaming. The lobby is located on the main page. It is conveniently categorized by top and new games, slots, jackpots, table play, live dealer, BTC releases and other entertainment. The selection of slot machines is the biggest one, and it can also be sub-filtered by the developer. Among popular options are Next Generation Gaming’s Prosperity Twins, BetSoft’s Fruit Zen, Net Entertainment’s Pyramid: Quest for Immortality and Microgaming’s Mermaid’s Millions. Jackpots can be hit at releases provided by BetSoft and Microgaming. Table play is limited to a few options, among which there are mostly poker variants like Caribbean, Texas Hold’em, Trey, Oasis and Let It Ride. Blackjack is represented by Surrender, Classic and Double Exposure variations. There is also baccarat, Hi-Lo and the roulette trio – American, French and European. On the other hand, the live dealer section offers plenty of options to choose from, including Punto Banco, Speed baccarat, T.R.P., and different blackjack and roulette types.